Christmas Tree Pin – This incredibly detailed piece of music jewelry will accent any wardrobe perfectly this holiday season. 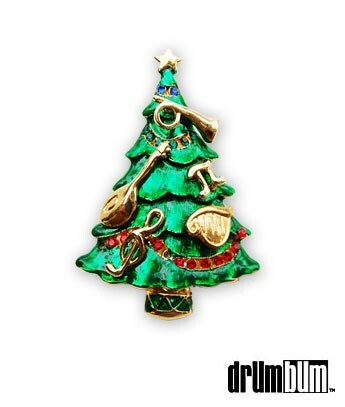 The music themed Christmas Tree Pin has gold toned music notes and a instruments adorning the tree. There are shiny rhinestones that add a sparkle to the pin. Made of metal and enamel. See our Christmas Wreath and Santa Pins.